Increase your expertise in loops with the help of our professional installer training course. 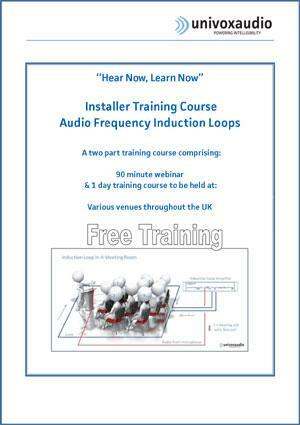 This two part induction loop training course is aimed at competent AV and electrical installers who want to gain the necessary expertise to design and install induction loop systems that meet the IEC performance standard IEC 60118-4, impress their clients and delight hearing aid users. Additionally, the course offers the first step to becoming a UnivoxAudio Accredited Partner. The course consists of a 90 minute webinar and one full day on site training. For dates and venues of our courses check out our calander of events on our website or contact Lucy@univoxaudio.co.uk. For full details, download our Installer Training Programme.